Engaging education is a solid way to sell to a customer base that already has faith and confidence in your brand. 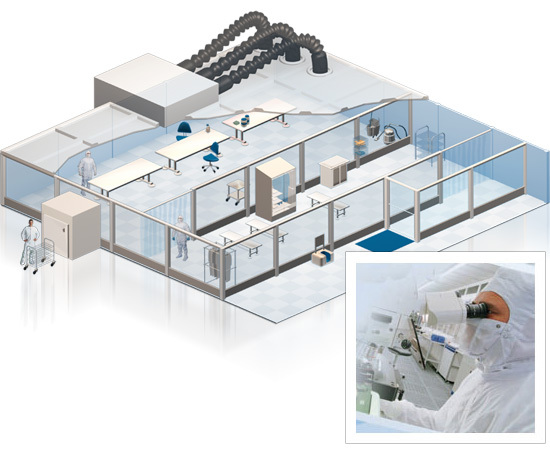 Fisher Safety sells a wide variety of products for clean rooms, and the goal in creating this model was to provide an interactive way to browse our clean room products. A customer who regularly visited FisherSci.com for gloves or foot covers might not have known we also sold carts, benches, gown racks, vacuums, clean room ready chairs, etc. This model was created in an isometric view in layers at a high resolution so that it could be easily reused in print material, stages in a sales PPT, or for a Flash (or JQuery) interactive for the web.